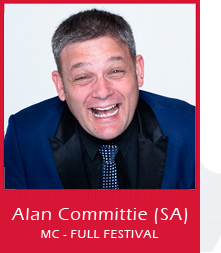 Alan Committie is South Africa’s top master of ceremonies and resident host for the last number of Funny Festivals. He is a character comedian, award winning actor, comedy writer and theatre director. He is renowned for his one man shows and his 950 plus performances in Defending the Cavemen. Alan’s productions play to full houses and he is regarded as one of the hardest-working comedy actors in the country. Alan is a born and bred Capetonian and was a school teacher in another life.